So, here I was, an English teacher in a good junior high school. The truth of the matter was that I knew very little about teaching because I had “skipped” grades 7, 8 and half of 9th, and I really had no idea of what went on in those grades. At Brooklyn College, even with a “practicum”, I had not learned much about education as I was to find it in New York City schools. Fortunately, the big, bad Board of Education came through with a series of curriculum bulletins outlining what was to be taught and how to go about doing it across all disciplines. They were a sort of road map of desirable subject matter and practices to get to the desired aim, which was for the students to learn what was considered important in those days. 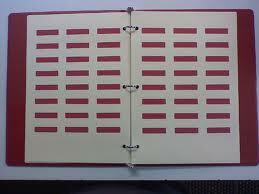 Those curriculum bulletins were so good that they were in demand by school systems in the rest of the country. While the curriculum bulletins were handy to have and to follow, it must also be said that teachers had the freedom not to follow them. So I began teaching with these metaphorical recipe books in my metaphorical hand. Now I was able to do the things that needed doing, and to find out what kind of teacher I was really going to be . I had a lot to learn. Classroom management is an important aspect of teaching. In fiction, particularly in movies, teachers (male ones especially) are most often presented as classroom martinets, and the point of these movies is always that severity earned the respect of students and actually worked. Stern and severe was absolutely not the way I could do things, and so I had to develop my own bag of tricks to avoid chaos in the classroom. 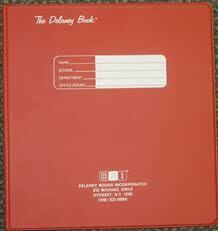 A handy little device was the Delaney Book. Don’t know if you’ve ever seen a Delaney Book or the little cards which fill them, but they became my first line of defense. Whenever a student did something he or she wasn’t supposed to be doing that interfered with what I was doing, I would look significantly at the offender, and officiously make a little black cross in one of the small boxes on the Delaney Cards. The little crosses where always of the Christian variety, and I always made sure that I made them in black. I also made sure that I always left the Delaney Book open on my desk, so that students could check it when entering or leaving the classroom. For some students, the multiple offenders, this was a frightening sight (as I intended it to be), as the little cards, with their little boxed crosses began to look like miniature graveyards. 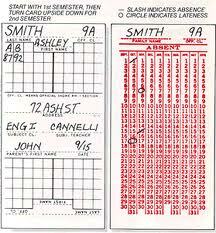 I attribute much of my early success to these little cards, as I never had to reprimand students publicly or make use of the various school offices that usually dealt with “discipline” problems. But there were some other tricks to be learned, particularly I had to learn that the rules, such as they were in their irrational glory, could not be applied to all students at all times, that these were little individuals I was dealing with, and that this was important. Did you ever intercept any notes written by girls in the classroom ? I did when I was teaching in the 1970s. That was a real shocker. Of course, I just threw them away and did not read them aloud.